Grand Forks, N.D., has leveraged the versatility of its new website, launched in July, by adding a fall leaf collection page. The page features a color-coded map that shows where city crews are and where they’re going next. The map will answer many of citizens’ questions about leaf collection, and reduce the number of phone queries directed to city officials. The dedicated section has risen to the top of the site’s “most popular” list. “Leaf pick-up is a service that, in the grand scheme of what city government provides, seems minor, but from a public standpoint it’s a big deal,” said Grand Forks communications specialist John Bernstrom. 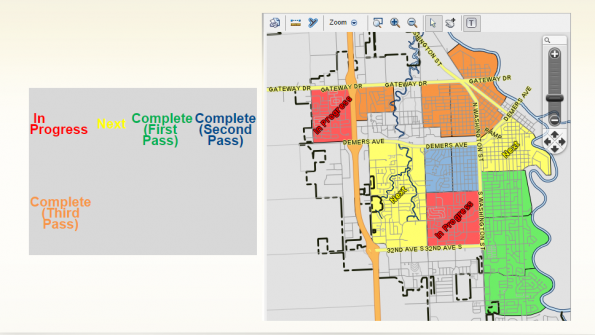 To keep residents informed, Grand Forks created a leaf collection webpage that includes GIS mapping, and then built a map that tracks the progress of leaf pick-up crews and plots where they’re going next. The results are paying off with a reduction in phone calls and e-mails to the city asking questions related to leaf collection. After the city’s last pass for leaf vacuum pick-up, expected in early November unless it snows, the city’s website team plans to issue a report to show City Council and department heads how much money the website leaf collection portal saved Grand Forks in terms of phone call and email response costs. “When people can serve themselves, it doesn’t cost us anything,” said Bernstrom. Vision Internet develops government websites. The firm has more than 600 government, non-profit and education clients in U.S. and Canadian communities with populations that range from less than 1,000 residents to more than 5 million. The company creates solutions that increase government efficiency, transparency and interactive communications with citizens. In the video, Joe Cabral, communications manager for the city of Lancaster Calif., discusses his city’s new website. He outlines how the new website can be frequently updated with new video feeds.